A lot of things came out of this year's E3 showcase, however there was one game I was excited about and that was Persona 5! Coming out of this year’s E3, Final Fantasy was once again on the lips of many gamers. Thanks to the spectacular Final Fantasy 7 remake trailer, it is safe to say Final Fantasy is still the series that comes to mind for a lot of gamers when they think of Japanese role playing games. This has remained true despite the fact the series hasn’t produced a critically acclaimed game for almost a decade now. As the face of JRPG’s, you could argue that this is why many have seen the genre as being a shadow of its former self. And yet the Persona series has consistently had great titles; boasting a slick style both in terms of aesthetics and music. The most recent release, Persona 4 Golden, is even hailed by some as being one of the best Japanese role playing games ever made. The release of Golden on the PlayStation Vita, along with an anime series and spinoff titles have been examples of the series’ rise in popularity. With Persona 5 on the horizon, now is the series’ best opportunity to lay down a marker as THE JRPG series that gamers should be talking about. Much like Persona 4, 5 will see player’s taking control of a protagonist that transfers to a new school for a year. He’ll meet new friends soon after his arrival, along with a shape-shifting cat (because why the hell not), all of which will make up the player’s party with each gaining their own persona to use in battle. The basis of the game will certainly sound familiar to Persona fans, however with this being the first Persona game on both PlayStation 3 and 4, Atlus will be looking to take advantage of the hardware at their disposal. P5 taking place in Tokyo already has fans super excited. With P4 taking place in the rural town of Inaba, the prospect of socialising in Tokyo is absolutely mouth-watering. What makes the location even more appealing is what the party gets up to once the sun goes down. Atlus has surely seen the rise in popularity of pulling off heists in video games and has decided to get in on the action. 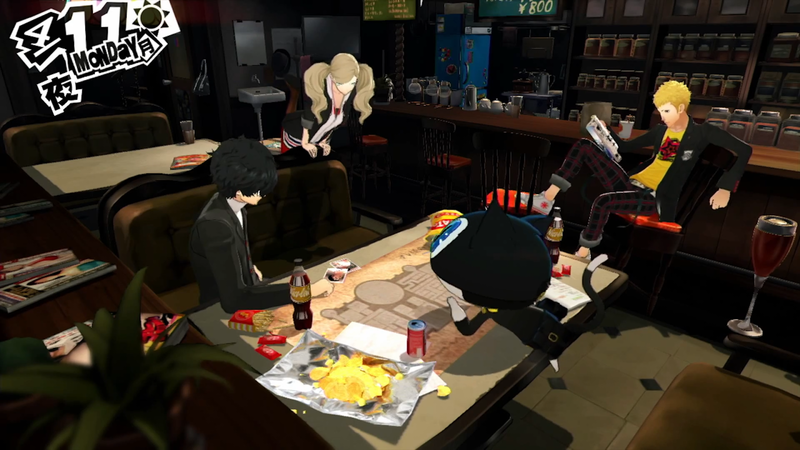 The P5 gameplay footage shown so far presented the party sitting around a map of floorplans, planning what must surely be a heist. So can you imagine pulling off a heist in Tokyo with your friends and a shape-shifting cat?! The dungeon crawling aspect of the game hasn’t been talked about much, however from the gameplay trailer, we can see the dungeon crawling’s going to be quicker and smoother than the game’s predecessor, with the protagonist now being able to take cover and jump over gaps. How taking cover will specifically work is unknown at this time, though I imagine it’d allow you to sneak up on enemies and get a pre-emptive strike going into battle. What truly helps the Persona series stand out from other JRPG’s is the social link feature. Your social links with not only your party, but other key characters in the game grant you bonuses in the form of additional abilities for your personas, follow-up attacks from party members and perks when creating a new persona. While it hasn’t been confirmed that the social links will have these same effects in Persona 5, they will be present though in a modified form. And while the social links have a lot of benefits gameplay wise, they are also unique in the way they help you to bond with the characters around you. By building your social links, you get to find out more about each character, whether it is their ambitions or their problems and through this, each character feels more like a fleshed out human being. As a result, the party from Persona 4 are adored by many that have played it, with some gamers finding the characters relatable to what they themselves have experienced in their own lives. Persona 5 is currently due for release worldwide before the end of 2015. While it’s likely to be released in Japan before the year’s end, its release in the west is looking less likely especially with its absence from E3 this year. Even if we do have to wait until 2016 to get our hands on Persona 5, it’s certainly going to be worth the wait…I mean come on…a shape-shifting cat!